Relations between Warsaw and Brussels have worsened after Poland attempted to prevent European Council President Donald Tusk from being reappointed for another 30-month term, but was outvoted by every other EU member - including its close allies, the Czech Republic, Hungary and Slovakia, Sputnik has been told. The latest row between Poland and the EU was caused by the Warsaw government's opposition to Tusk — a former Polish prime minister and opponent of the ruling Law and Justice Party (PiS) and current Prime Minister Beata Szydło. Poland had put forward its own candidate, Jacek Saryusz-Wolski, a little-known MEP, but was outvoted 27-1, putting it at odds with all the other member states, marking a new low in the already tense relationship between Warsaw and the EU. "I think it was not a very smart idea on [the part of the] Law and Justice Party. Everything the Polish government is doing is focused on internal politics, not international politics. They have no idea how to do their politics in Europe. It was a very stupid idea to block Donald Tusk, just to show [independence] from Europe, which is not smart," Agnieszka Wisniewska, editor of the website Political Critique told Sputnik. The Polish government has been in dispute with the Commission for more than a year and he been given a series of warnings — including a threat to withdraw Poland's voting rights in the EU, a sanction that has never been invoked before. 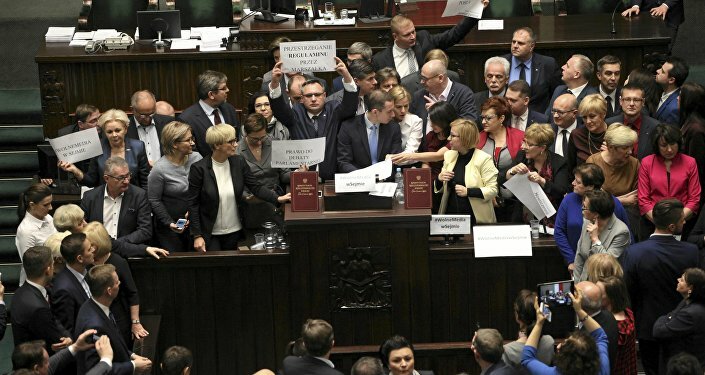 The dispute arose from changes made by the Polish government to the country's Constitutional Tribunal, December 2015, adding five "politically friendly" judges, in a move seen by critics as making it easier to push through legislation with less opposition. In December 2016, the Commission officially warned Warsaw that it would remove its voting rights in the EU, if the Polish government did not roll back the controversial changes to its Constitutional Court, for being in breach of the EU's "Rule of Law," which demands the separation of government and the judiciary. "Everything they are doing is going to make Poland look like a country that is not important. Everyone is going to think that the government doesn't think seriously about European politics. They are focused only on national discussion. Poland was a serious partner for years. That's why Donald Tusk had this important function [as President of the European Council]. Everything the government is doing now is making Poland look like not a serious partner," Wisniewska told Sputnik. The EU's threat involves invoking Article 7 of the Treaties of the European Union, which allows for it to: "suspend certain of the rights deriving from the application of the Treaties to the Member State in question, including the voting rights of the representative of the government of that Member State in the Council." Article 7 has never — so far — been invoked against an EU state. The latest spat over the Tusk reappointment has left Poland even more isolated within the EU — particularly because it did not get the backing of its fellow partners in the Visegrad Group (V4)— the Czech Republic, Hungary and Slovakia.